Reboot Lab workshops are designed with the ambitious musician in mind. It’s for those looking to fine tune musical skills while learning how to navigate the current business of music. 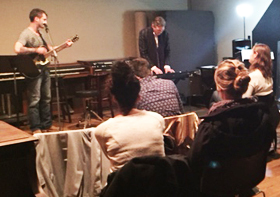 These workshops cover topics such as: songwriting, performance, recording, studio process, practicing, PR, listening, the story inside the song, groove and technique. The session is an open forum where participants are encouraged to ask questions relating to the art of making music and performing. This is the third year of sessions for Reboot Lab. The idea for Reboot Lab was born from an interesting beginning – Brian was Ashwin Sood's music teacher. 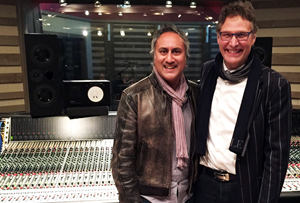 He saw qualities in Ashwin that could not be ignored and Brian became an integral mentor and ongoing teacher in Ashwin’s journey to becoming a respected professional and accomplished musician (Drummer with Sarah McLachlan, Jason Mraz / Producer / Talent Scout). Their combined history and background provides a unique and big picture approach that makes Reboot Lab stand out from all other industry workshops. Look for Reboot Lab to be launching workshops nationwide in the very near future! *As a Christmas gift from me to you, add promotion code VOCAL to the subject line of your email to receive an additional $50.00 off the cost of the workshop. "The workshop today was excellent-- so exciting and invigorating ... you gave inspirational advice for aspiring artists, and showed them what they're capable of with self-confidence! Everything you said was perfect--I loved that you not only reinforced many of the concepts I bring to the class, but also bolstered that sense of self-esteem and honesty that the students need in order to be accomplished performers and artists! Thanks so much for your time, energy, passion, and expertise."